This past summer, United Way was working hard to minimize the loss of learning that occurs when young minds sit idle. Summer reading loss is very real. Studies show that children can lose one to three months of learning over the summer. Many parents are not even aware of the negative impact of summer learning loss. To combat the ‘summer slide’, United Way launched three programs to help kids over the summer – United Way’s Feed and Read program which provided nutrition, mentoring, and free books to low income children during the summer school break and a summer learning loss awareness campaign and free access to thousands of digital books on myON for all elementary school children in Brevard. Brevard Public Schools and United Way also teamed up on an initiative to promote the importance of reading over the summer. This summer marks the sixth year United Way of Brevard has partnered with Brevard Public Schools to launch an aggressive awareness campaign to help parents understand the devastating effects of summer learning loss. The awareness campaign was two-pronged. The first priority was to ensure parents, especially those of elementary aged school children, understand why it is so critical to keep kids reading over the summer. The second goal, which was just as important, was to keep kids reading over the summer. Campaign elements included awareness brochures delivered to all VPK – 5th grade students that include simple activities to keep kids interested in reading as well as tips and resources for helping kids become readers. Plus we’ve added an incentive to help encourage reading over the summer. Kids at Brevard Public Schools who read the required number of books and turn in results to their school will earn an ice cream party. The campaign also includes an 10 week multi-media awareness campaign to include: radio, tv, facebook, billboards and print advertising. Click here to see the Summer Slide Brochure! To succeed in school and life, children and young adults need ongoing opportunities to learn and practice essential skills. This is especially true during the summer months. According to Reading is Fundamental, low-income children and youth experience greater summer learning losses than their higher-income peers. On average, middle-income students experience slight gains in reading performance over the summer months. Low-income students experience an average summer learning loss in reading achievement of more than 2 months. Summer learning loss contributes to the achievement gap in reading performance between lower- and higher-income children and youth. Research demonstrates that while student achievement for both middle- and lower-income students improves at similar rates during the school year, low-income students experience cumulative summer learning losses over the elementary school grades. Students reading increases over last summer! 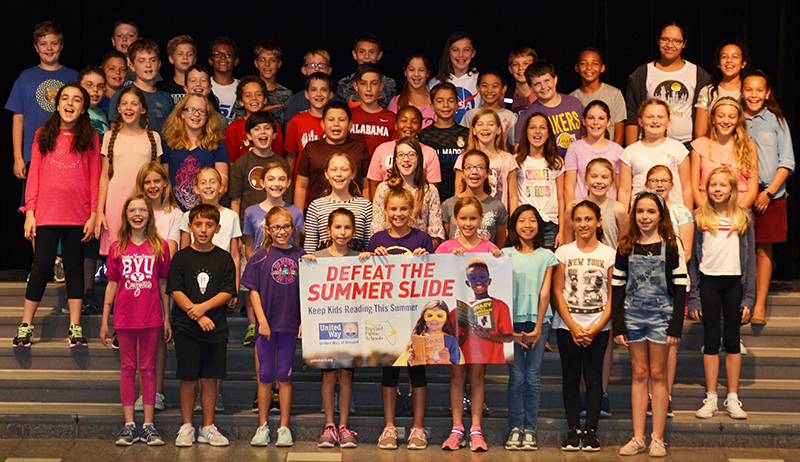 United Way and Brevard Public Schools are celebrating elementary aged children who stepped up to read over the summer as part of the summer learning loss awareness campaign. This past summer, 4,168 elementary school students read as part of a summer reading contest. Students have been celebrating their success with ice cream parties sponsored by United Way. Quest Elementary had the most student participation with 435 students completing the reading challenge. “Our students’ determination to continue to read and learn over the summer is truly impressive – and will be rewarded with continued academic success,” said Brevard Public Schools Superintendent Desmond K. Blackburn. United Way’s Feed and Read program provided 15,000 food packs and 30,000 free books to 4,800 low income children during the summer school break. IMPORTANT- Do not use your browser's Back/Forward buttons. It may result in a loss of data or being logged out of the site.